Britain's railways have become progressively less interesting over recent years but it wasn't always that way. Most of my British material is on film and I've made a start on scanning some of the early 35mm slides. There are also some digital images taken before I lost interest in 2003 and more from the last few years. Areas featured include the ECML around York, Kings Cross and Edinburgh in 1981/2, Bedlay Colliery in Lanarkshire around the same time and the Thames Valley in 2003 and 2014-2017. It all started with a chance encounter with a 4-6-4 tank in the Black Forest in 1973. From then on I was hooked on foreign railways in general and Germanic locomotives in particular. Trips to Germany were sporadic at first but I’m now a regular visitor and the galleries have expanded to over 1100 photos covering many of the country’s scenic diesel and electric lines. All of the photos here were taken since 2006 but pictures from earlier trips will be added as time permits. 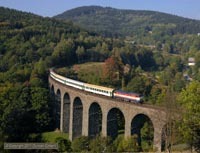 Switzerland is famed the world over for its beautiful alpine scenery and its excellent transport system. The railways are a real delight with a huge variety of gauges, railway companies, locomotives and liveries all running through the picturesque Swiss landscape. 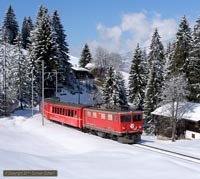 The 60 galleries contain more than 530 photos of standard, metre and narrow gauge operations across the country, with the emphasis unashamedly on the superb Rhätischebahn network in Graubünden and the busy Gotthardbahn. Denmark isn't the most obvious destination for railway photography with little in the way of dramatic mountain scenery, limited freight traffic and few loco hauled passenger trains. However, it was certainly worth visiting Jutland in July 2014 and July 2015, when freight traffic to Germany was diverted via Esbjerg and Tønder with diesel haulage. Austria has long been a natural target for the railway photographer. Its steam locomotives were very distinctive and pockets of steam operation lasted well into the 1970s, its electric locomotives worked to a grand old age and usually outlasted their contemporaries in other parts of Europe and the scenery was magnificent. In recent years most of the variety has been swept aside but the scenery is still superb. Most of my Austrian material is on film and will need to be scanned before it can appear here. In the meantime, here are a few digital images from trips in 2003, 2010 and 2014. The Czech Republic is one of Europe's smaller lands but its railways are among the most interesting. In an era of demanning, DMUs and standardisation, it was a pleasure to find a railway with manned stations and locomotive hauled trains, a variety of traction and an almost infinite multiplicity of liveries. The landscape is extremely attractive with plenty of hills, forests and picturesque villages to include in the pictures. Over 600 photos from my many trips are displayed here. Another small central European country with an interesting rail system. 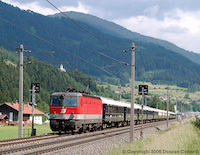 Although both the Czech Republic and Slovakia share a common railway heritage, there are significant differences in some areas such as liveries and the rates at which some of the older classes have been withdrawn. One thing that the two countries do share is a very attractive landscape. The galleries now contain over 200 photos from trips in 2003 and 2011. Although France is Britain's nearest neighbour, French railways haven't featured on many of my trips. These pictures were taken on trips to the superbly scenic but lightly trafficked main line along the Mediterranean coast north of the Spanish border and the trunk route through the Saverne Gap west of Strasbourg. All the photos were taken on recent trips since 2008. Spain used to be home to an incredible collection of charming narrow gauge lines but most have now closed or lost much of their appeal through modernisation. The Soller Railway on the Mediterranean island of Mallorca is an exception and still retains its unique character. There are also pictures of the superb Ponferrada - Villablino line in steam days and main line diesels around Murcia.